Boron Carbide is a superiorly hard material (Mohs hardness > 9) and is one of the hardest materials known behind Diamond and cubic boron nitride. The material is sought after due to its high hardness, abrasive wear resistance, fracture toughness, chemical inertness, and important to the nuclear industry, a high neutron absorbing cross section. 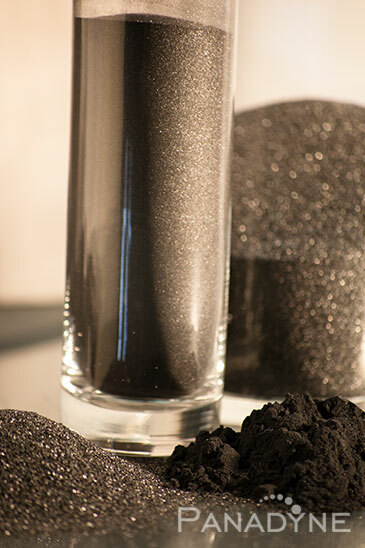 Boron Carbide powders can be used for reaction bonded, hot-pressed or sintered ceramic applications. The material is therefore well suited for technical ceramics, wear parts, and other industrial parts such as body and vehicle armor. Other uses include refractory additives and honing sticks. Boron Carbide is produced by the reaction of Boron Trioxide and Carbon at high temperatures in an electric arc furnace. The material is then milled and purified. Panadyne offers the Boron Carbide in straight FEPA sizes as well as custom sizes.